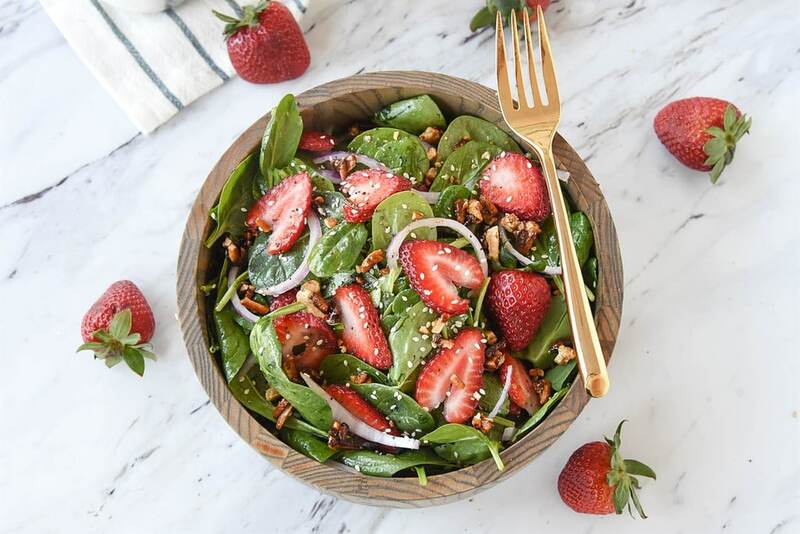 Strawberry Spinach Salad with poppy seed dressing is a classic salad recipe that everyone will love. Today is one of those “I think everyone probably has it” recipes. 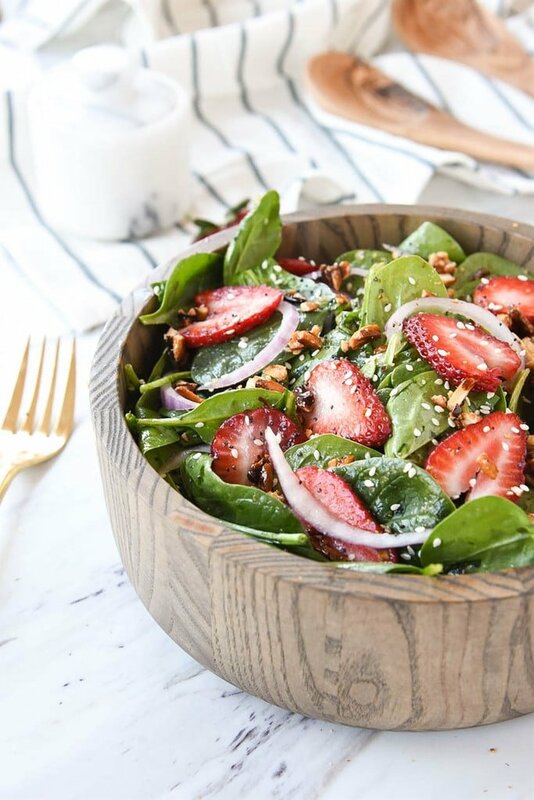 At least everyone has a version of this strawberry spinach salad, but there is probably a reason for that. Because it is so good! 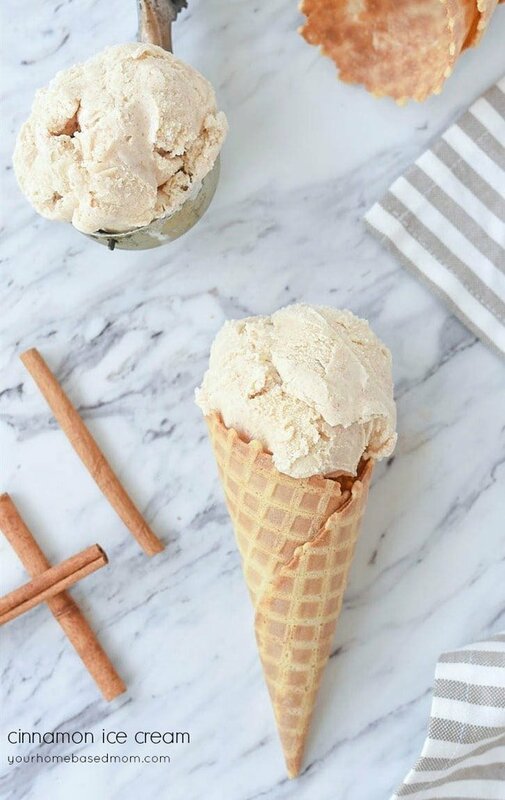 So I had to share my recipe with you. 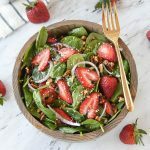 If you don’t yet have a strawberry spinach salad recipe or a poppy seed dressing recipe that you love, you will now! And if you already do have a favorite, I promise this one is worth a try. 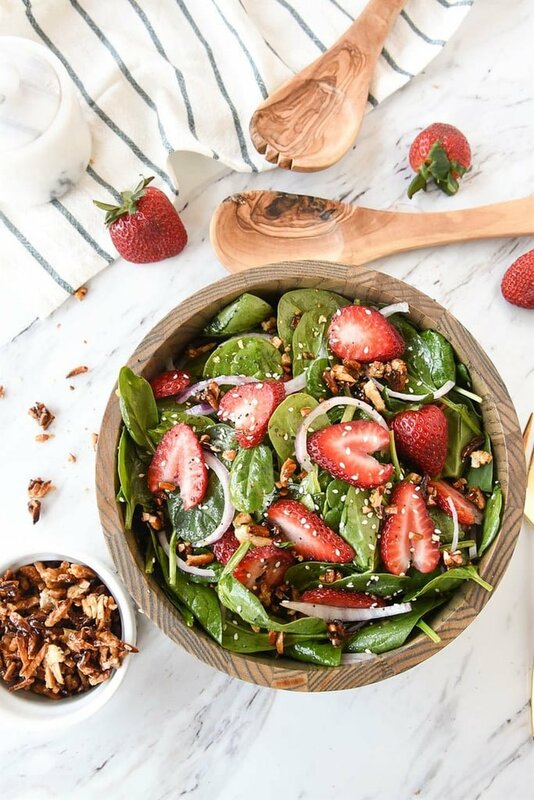 I have been making this Strawberry Spinach Salad recipe for years. My friend Laurie brought it to a potluck and I knew I had to have the recipe. It was delicious. I served it last Easter and will be serving it again this year. 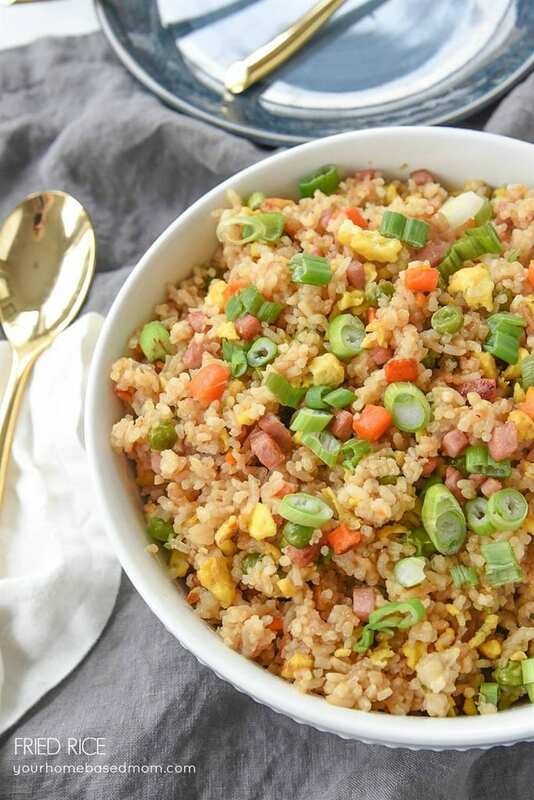 It has become a staple on our Easter dinner menu, but is great all spring and summer long. Actually anytime you can find good strawberries. 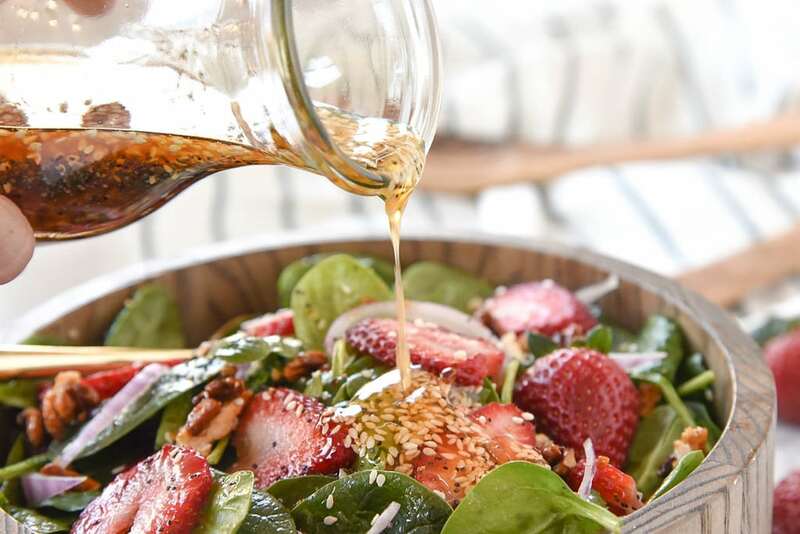 I love the poppy seed dressing from this recipe. 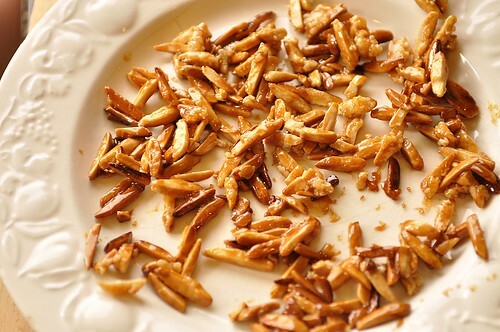 It is made not only with poppy seeds but sesame seeds as well. It is one of those staples that I keep in my refrigerator. The addition of some sliced strawberries, red onion and sugared almonds dress it up and make it look oh so pretty. The salad is light, fresh and lots of great flavor. In case you have never sugared nuts I have a little tutorial for you. 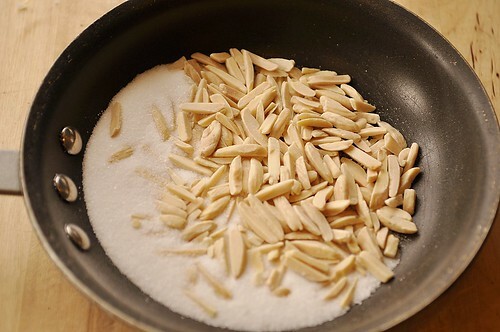 I use either slivered or sliced almonds, both work great. 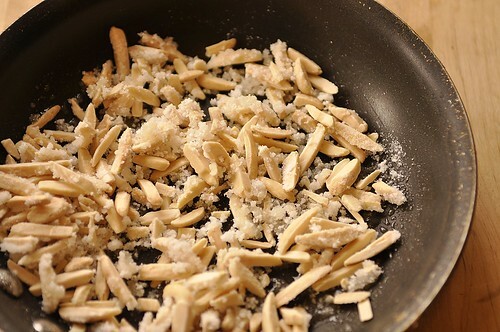 Combine a 1/2 cup of nuts along with 1/4 cup of sugar in a small frying pan. Turn the heat onto medium and stir. It will take a few minutes for anything to happen. First it will look like this…. The sugar will begin to clump up around the nuts. And then before you know it the sugar will have totally melted and the nuts will be coated and brown. Be careful because it can go from nothing to burned pretty fast. Be sure and stir continuously. I spread the nuts out onto a slightly greased plate for them to cool and dry. You will need to break them apart a bit before adding them to the salad. They add the perfect crunch and sweetness to any salad. PASTA/SALAD BOWLS – these pretty white bowls work for pasta, salad or soup. 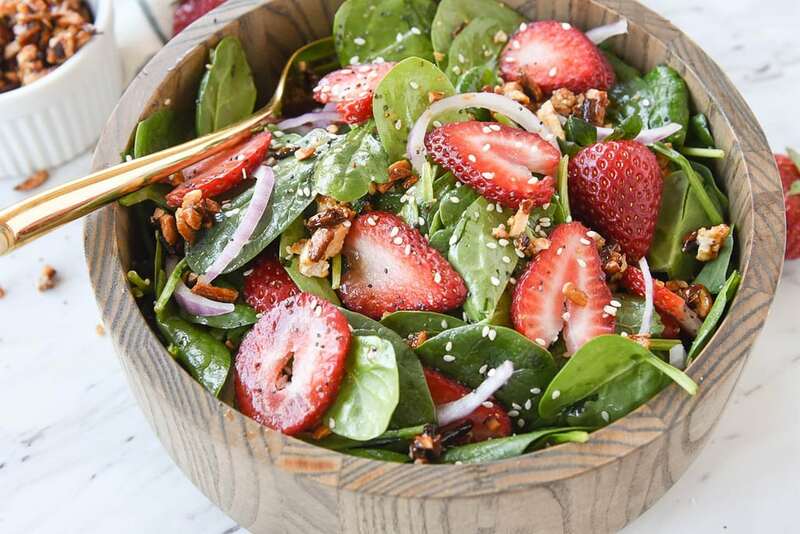 Combine spinach and dressing and top with strawberries, nuts and red onion. 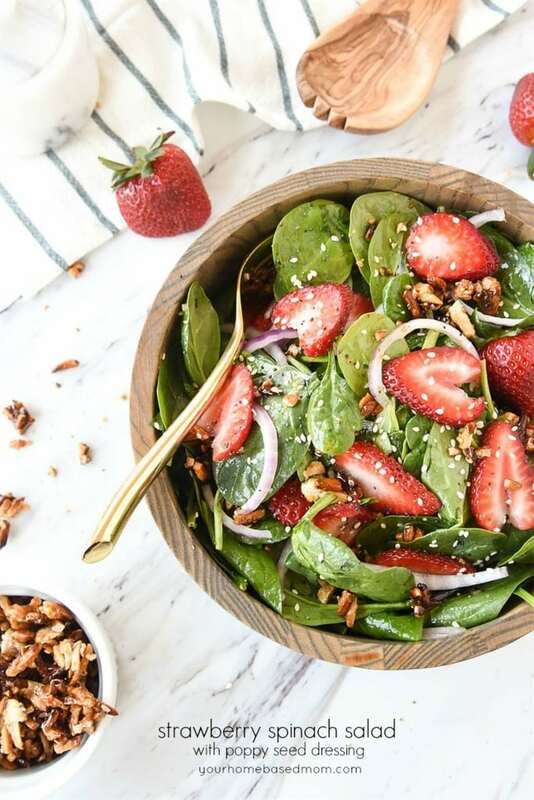 I am DEFINITELY one of those people looking for your spinach strawberry salad recipe! I had it years ago and a few months ago was looking on your website for it. Now it is here! YAY! I LOVE this salad! I love this salad! I sometimes use raspberries instead of strawberries, but they only work when they’re fresh (you don’t want a drippy red salad). I love the combination of the sweet (berries) with the bitter (spinach), and then the acid (dressing)… Yum! I ate supper already, but now I’m craving this salad! thanks for reminding me of this, i love this salad! 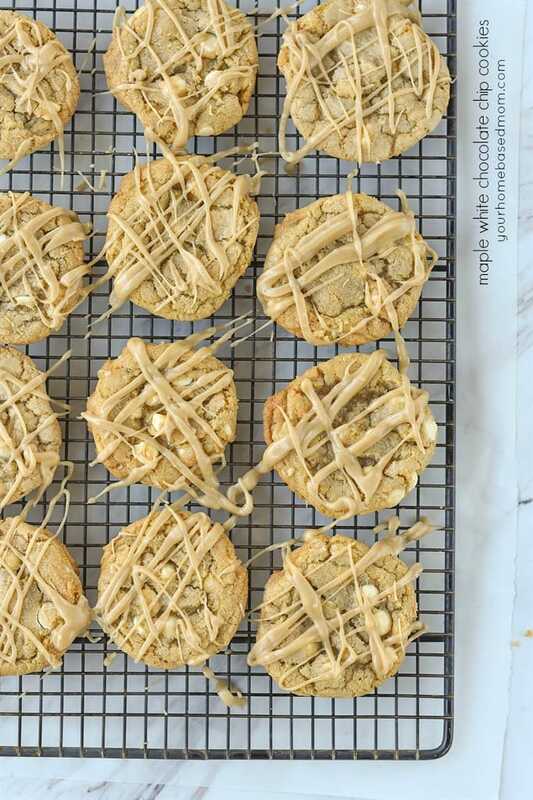 i think i’ll be making it for easter, do you have more recipes coming? This was a delicious addition to our Easter menu, and it’s now on my blog, with links to your post. Thank you! I wish I would have taken a picture of this salad on Easter Sunday because it was so pretty & it was most definitely YUMMY! Everyone at the table enjoyed it. Thx for the recipe! Haha! I thought I invented the spinach strawberry salad! Maybe it’s a west coast thing? Here in New Hampshire, everyone is amazed! I always add blanched sugar snaps and use a shallot vineagrette dressing. 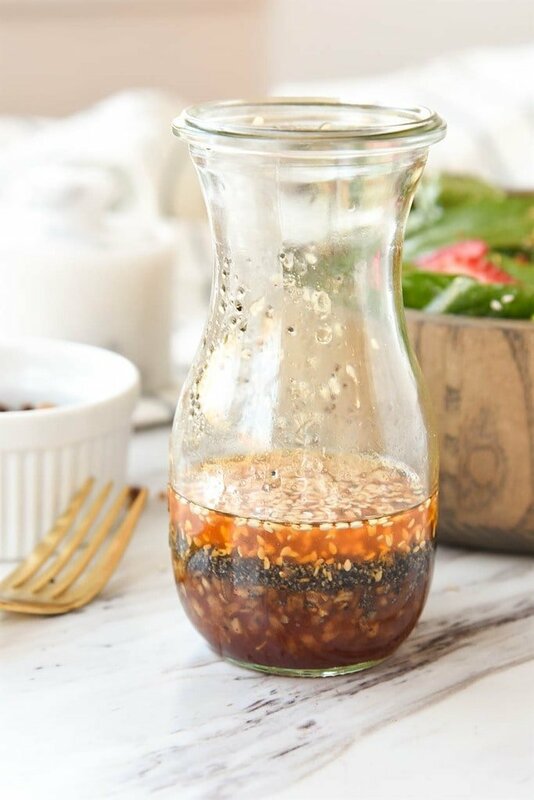 Your poppy seed dressing sounds amazing though and I will make it next time I have the salad (tomorrow!). I just found your blog (via Gordon Gossip). I’m browsing your archives and loving everything! So I was looking at the recipe and notice it says 1/2 Canola Oil is that a 1/2 Cup? Can someone help me out. I made this for my best friend on Saturday, it was SOOOO good! The sugared almonds were so easy and so amazing. I happened to have blue cheese and fresh blueberries in the fridge and added those too! Thank you for your great recipes. You mentioned that your friend Laurie took this to a potluck. Does the spinach get soggy with the dressing left on for awhile? 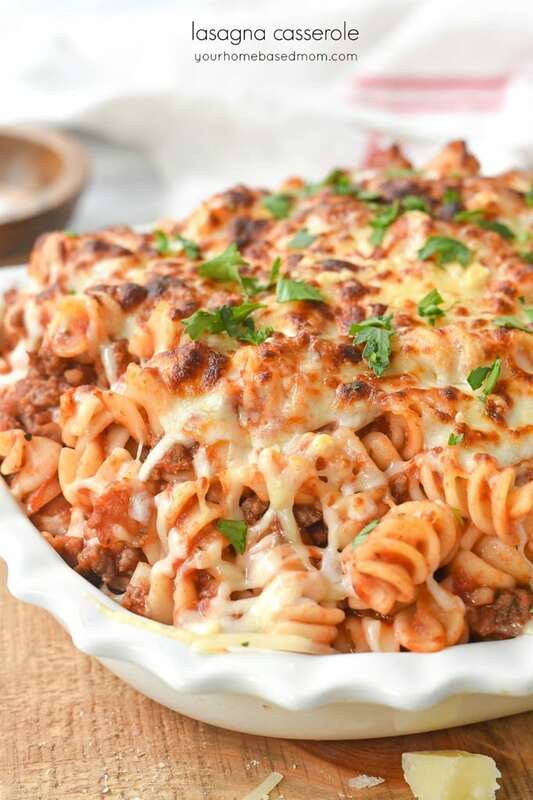 I would love to serve this at a Grad Party this weekend, but am concerned about soggy salad. I’d love some thoughts/tips on this. I always add the dressing right before serving or it will get a bit soggy. It never lasts long enough to get too soggy!